Horizons’ twin towers are landmarks in the Downtown San Diego skyline. The Horizon Condos, Penthouses, Homes for Sale are considere among the most valuable in Downtown San Diego Real Estate. Horizons is bordered by Market Street, Island Avenue, First Avenue and Front Street and is a short walk from the bay, seawall, beaches, parks, business core, shopping, restaurants and nightlife. 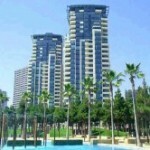 Built and Developed by BOSA, the complex is luxury concrete construction, and was completed in 2001. The spectacular concrete towers open toward an inner courtyard of lush greenery and inspiring waterfalls that together create a sense of sophistication, privacy, and peace. While residences vary in size from 1036 sq. ft. one-bedrooms to 2918 sq. ft. penthouses, they all feature superior craftsmanship and quality, typical of BOSA developments. HOA dues are on the luxury level with amenities which include: lap pool, 24 hour security, gated community with concierge station at complex entrance, community rooms, and a fully equipped fitness center. Homeowners and residents of Horizons are very proud of their complex. They love the central location and luxury living features. All units are well appointed, and feature either city or bay views depending on floor and orientation. Floor Plans Include Two and Three Bedrooms 1105-2267 sq. ft.